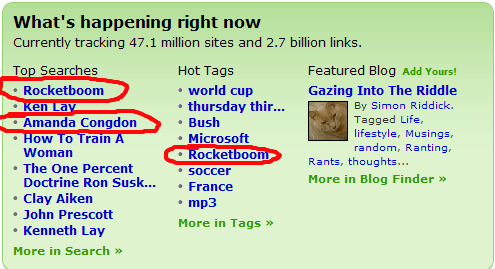 Rocketboom? Amanda Congdon? Who Cares? Big whoop, some woman on some video blog I never could be bothered to look at is no long on the video blog. I still haven’t looked at it. Unfortunately, my disinterest is far from universal, and so half the blogs I’ve been looking at over the last few days are part of some big circle-jerk on the subject. Or maybe it was the combination of “Amanda Congdon” & “Circle Jerk”? For shame, boys, for shame. This entry was posted in General on July 6, 2006 by eas. I couldn’t agree more….why is this subject the most talked about thing for two days? I DID look at it , after never having heard of it, and I found it to be utterly annoying after 4 seconds.